A direct flight from Newark to Singapore is currently the longest flight by duration. A view of the Qatar Airways Boeing 777 that completes one of the world's longest commercial flights. Editorial credit: NextNewMedia / Shutterstock.com. The phrase "longest flight" can refer to various things, among them being the distance and the duration between the origin and destination. In our article, we will be focusing on the longest non-stop flights in the world by flight duration. The longest flight currently available is the Singapore Airlines flight that travels from Newark to Singapore, with a maximum scheduled flight duration of 18 hours and 45 minutes. Interestingly, the Newark to Singapore flight is also the world's longest flight by distance covering 9,534 miles (15,344 km). The longest non-stop flight in the world is Flight SQ 21 from Newark Liberty International Airport in New Jersey, United States to Singapore Changi Airport in Singapore. The flight covers a distance of 9,534 miles (15,344 km) and is scheduled to take 18h 30m to 18h 45m. SQ 21 is flown by Singapore Airlines on an Airbus A350-900. The plane has a fuel capacity of 165,000 liters (44,000 US gal) and a maximum range of 11,185 miles (18,000 km). The first flight took place on October 11, 2018 (this route was previously operated from June 2004 to November 2013 but was discontinued). 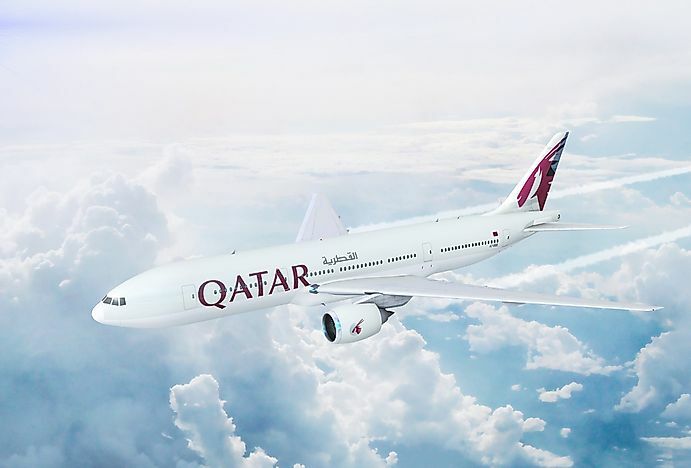 The second-longest non-stop flight by both duration and distance is from Auckland, New Zealand to Doha, Qatar. The flight was introduced on February 5, 2017 by Qatar Airlines and covers a distance of approximately 9,032 miles (14,535.6 km). The airline uses a Boeing 777-200LR aircraft for this non-stop route to Qatar. 777-200LR (long-range) is a C-market model which is designed to work as a long distance commercial airline. Boeing 777-200LR was introduced in 2006. It takes over 18 hours and 20 minutes to travel from Auckland to Doha making it the longest flight by great-circle distance. The third longest route is the flight from Los Angeles, California, United States to Singapore. United Airlines introduced this non-stop flight on October 9, 2017, with its main aim being to save about two hours. The first aircraft to fly this route took off on October 27, 2017, and it reached Singapore after 17 hours and 50 minutes. The journey is approximately 8,770 miles long. It is the second longest non-stop flight from the United States. Before the introduction of the non-stop direct flight from San Francisco, California, United States to Singapore, passengers had to take the longer route through one of the Asian countries and then board a direct flight to Singapore. The direct non-stop flight shaved off some few hours on this trip thus making it possible for the aircraft to cover 8,446 miles within 17 hours and 35 minutes. United Airlines was the first to launch their direct flight on June 1, 2016, followed by Singapore Airlines on October 23, 2016, which guaranteed the passengers two aircraft flying this route daily. United Airlines is using a Boeing 787-9 aircraft while Singapore Airlines have Airbus A350-900 model. As discussed above, Flight SQ 21 from Newark to Singapore is the longest flight by both duration and distance. The original flight in June 2004 covered 9,534 mi (15,344 km) in approximately 18 hours. Interestingly, the return flight, Flight SQ 22 from Singapore to Newark, covered an even longer distance of 10,315 mi (16,600 km) but took only 17 hours and 45 minutes due to high-altitude winds.